Most of us can agree that Season One of USA’s Mr. Robot was a big deal. Last summer, this was the show that practically everyone felt the need to talk about. There were theories, thematic discussions, and a thrilling feeling that you were part of a conversation that everyone was having. The show was new, it was flashy, and it was exciting. HBO’s The Leftovers, on the other hand, was a relatively small deal during its first season. After much excitement and buzz, the series seemed to debut with more of a whimper than a bang, and it was hard to find takes that weren’t completely confounded or ambivalent. In their second seasons, the narratives for these shows flipped. The Leftovers became the show that couldn’t be missed, while Mr. Robot seemed to become little more than a blip. Now, Mr. Robot’ second season hasn’t been a failure, and The Leftovers wasn’t earning gangbuster ratings in its sophomore year. It just seems clear that the buzz has perceivably shifted away from Mr. Robot. There have been plenty of pieces written about what appears to be happening to the show, and why it can’t seem to thrill audiences the way it once did. Part of the problem is that, no matter what the show does during its sophomore season, it can never reclaim the sense of excitement that accompanied its initial run. Part of that must be attributed to expectations. Mr. Robot’s first season was a surprise smash, and its second season had to live up to that reputation. It was a near-impossible task. Mr. Robot also faltered in much more problematic ways, though. The twist that occurred around the midpoint of the second season was widely decried as unnecessary and a waste of viewer time. And really, this is at the heart of what makes Mr. Robot’s second season so disheartening. The first season was propulsive. It introduced us to a world where its characters had a clear objective, and were working towards carrying that objective out. And at the end of Season One, Elliot and F Society succeed in taking down E Corp. That’s it. Mission accomplished. Season Two picks up right there, and is forced to deal with the ashes that Elliot and company created when they burned the world down. There’s no clear direction, and so everything begins to drift. We know these characters, and we know the world that they live in, but the rest is a mystery. What’s the goal? Where are things headed? The audience had no clue, because the show burned through all of these questions in its first season. Thus, the second season was left with a series of open-ended questions that were incredibly difficult to answer. Mr. Robot is proof of what can happen when your first season is filled with hooks. The Leftovers faced the opposite problem. Its first season was based in a series of inactions, and was often oppressive. The characters were almost all inert, and their goals were a mystery to one another and to audiences. As a result, the show felt lifeless, simply a series of strange occurrences that stressed to the audience how horrifyingly sad the characters were. With its second season, The Leftovers performed a soft reboot. It relocated to Texas, introduced vibrant new characters, and became a much more watchable show. The easiest thing to forget about The Leftovers’ drastic Season Two change is the ways it shifted its plot. Season One was building to something, but it was unclear what that something was until very late in the game. When we finally understood what the Guilty Remnant were planning to do to Mapleton, it was a sudden surprise because we hadn’t realized they were planning anything at all. The thrust of the season season’s plot is a mystery unveiled in the very first episode. Evie, the daughter of new characters John and Erika, disappears along with two friends, and much of the season is focused on where they might have gone. The Leftovers uses the disappearance as a hook. It’s a reason to care, so that the show can do the things it is more interested in doing. The Leftovers created a plot to tell stories about its characters in its second season. It was able to do this because we already knew who many of these people were, thanks to the first season. All the second season really did, therefore, was place them in a more interesting situation. The problem The Leftovers faced in its first season is one that the second season overcame, mostly by streamlining. The characters were interesting even early on, but their situation wasn’t. Season Two simply remedied that. Mr. Robot faced the opposite problem. The revelations the show gave audiences at the end of its first season—first that Mr. 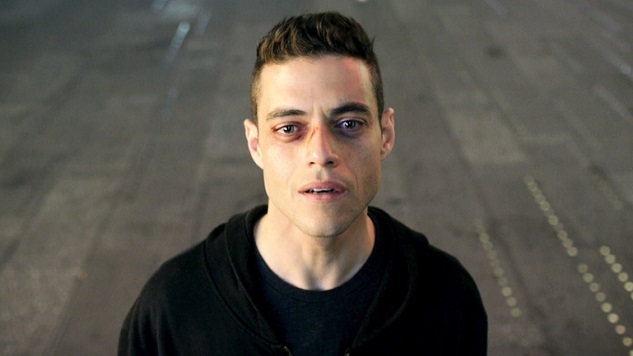 Robot was Elliot’s father, and then that he was a hallucination—fundamentally shifted the show’s focus. It turned a series about revolution into one about family and mental illness. The struggles Elliot was facing were much more internal than viewers had been led to believe, and the rug was pulled out from under the show in ways that it’s still trying to reckon with. Season Two has relied on the same conceit that The Leftovers’ first season did; fundamentally, it’s the hope that you care enough about these characters to watch them no matter what they’re doing. Mr. Robot has interesting characters, but these characters only became the thrust of the show very late in its first season. General expectations seemed to be focused more on the show’s intricate plot than on the players within it, and so Season Two feels out of place and, in many ways, directionless. Sophomore seasons are necessarily different from the inaugural season that came before them. What’s interesting is that these differences are in and of themselves evidence of what the show may actually be. Halt and Catch Fire’s second season works in a similar vein to The Leftovers’. In many ways, both are very intimate character dramas that succeeded in their second seasons by completely shifting the focus. With Halt and Catch Fire, the first season tells us who these people are, and the second season puts us in situations where we are forced to care. Joe MacMillan’s first season arc makes him feel like an imperfect Don Draper clone. In its second season, Halt and Catch Fire examines how Joe attempts to deal with his Draper-ness and prove to the world that he isn’t evil incarnate. The AMC series was infinitely better in its second season, because it made its characters self-aware. Like those on The Leftovers, they were simultaneously interesting and stagnant early on, unable to completely prove that they were worthy of time or attention until the second season began to unfold. On the contrary, UnREAL is another show that suffered from the same problems that plagued Mr. Robot. In its initial run, UnREAL was new and exciting, a show that allowed its audience to engage in the culture of The Bachelor, even as the show itself lambasted such affairs. The second season was plagued by accusations of insensitivity and even racism, but it was also just plain bad, and for reasons that are also true of Mr. Robot’s new season. UnREAL chose to rehash much of the plot that made up its first season, which was a problem precisely because the first season felt so original. While new angles were explored, it fundamentally felt like no real evolution was occurring. Instead, we were watching characters who were stuck in a rut, forced to convince themselves that what they did was for the greater good, even though everyone involved knew it wasn’t. UnREAL was unsuccessful in its sophomore year because it tried to replicate the heavily plotted, off the rails magic of its first season. It couldn’t do it, and its characters didn’t have the legs to justify the nonsense decisions of the second season’s plot. Thankfully, Mr. Robot’s’s second season hasn’t been a disaster on the scale of UnREAL, but it has been a letdown. The revelation that Elliot had been in jail for the first half of the season didn’t feel like a twist—it felt like a pointless inevitability and a rehash of the first season’s revelations. The urgency that accompanied the first season has been somewhat sapped from the show, and it remains to be seen whether it can sustain itself in this new mode. What is clear, though, is that the second season can be whatever a show makes it. Thanks to the golden age of television, even mediocre shows with promise get renewed. The Leftovers took its characters to truly innovative places in its second season, as did Halt and Catch Fire. They were able to make these bold choices because they knew that, on some fundamental level, the people in these worlds were interesting. Mr. Robot has chosen to spend its second season on characters that we weren’t entirely sure we should care about until its first season was almost over. This is the show Sam Esmail always wanted to make—one about the people at the core of this world, the ones that these elaborate plans revolve around. What remains to be seen is whether or not these people are worthy of our attention.